Hibernian manager Paul Heckingbottom has given the club their "identity" back, says former Easter Road midfielder Michael Stewart. Lethal finishing has been key to getting into Rob Maclean's Scottish Premiership team of the week, but who made the cut? Read more on Who made Rob Maclean's team of the week? Read more on Who was your man of the match? Read more on Who tops Premiership form table in 2019? Yves Ma-Kalambay races from his goal in the Scottish Cup fourth-round meeting with Hearts at Easter Road, allowing Christian Nade to opening the scoring. 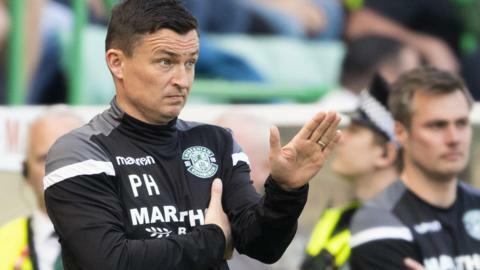 Paul Heckingbottom has yet to taste defeat in nine league games as Hibernian head coach and won his first Edinburgh derby. These are the numbers behind his success. Celtic duo Odsonne Edouard and James Forrest, plus Rangers' Ryan Kent, are among the players to make Rob Maclean's team of the week. A striker colossus, and the scorers of two stunning goals feature in BBC commentator Rob Maclean's team of the week. Find out which scorers and other top performers make the cut in Rob Maclean's Scottish Premiership team of the week. Who made it into the team of the week? BBC Scotland's Rob Maclean talks his through his team of the week from the weekend's Scottish Premiership action. Read more on Who made it into the team of the week?